We can honest about that, right? It’s strange to hear that freshman senator with 13 months on the Foreign Relations Committee has a “major address” to give. But Marco Rubio has been giving Major Addresses since last summer, in Washington, on campuses, at the Reagan library. (Like the rising Barack Obama, he’s deluged with invitations for things like this.) Rubio’s speech at Brookings was meant to prove that he could credibly run with Mitt Romney or credibly run for president in 2016. Here’s Rubio today, on China. Would a world order where China, at least as we know it right now, was the leading power be as benignly disposed to the political and economic aspirations of other nations as we are? …We hold out hope for a new China of tomorrow, but for now we must deal with the China of today. A China which enjoys its closest relationships with countries such as North Korea and Iran. So, at least for now, it would be foolish to be confident in the idea that China can be counted on to defend and support global economic and political freedom or take up the cause of human rights. Here’s Romney from his last major foreign policy address. I see a handful of major forces that vie with America and free nations, to shape the world in an image of their choosing… the anti-American visions of regimes in Iran, North Korea, Venezuela, and Cuba—two of which are seeking nuclear weapons. And these forces include rising nations with hidden and emerging aspirations, like China, determined to be a world superpower, and a resurgent Russia, led by a man who believes the Soviet Union was great, not evil. So, agreement: China’s ambition has to be watched and checked, somehow. But Rubio takes a more empathetic tack on Russia. “Putin might talk tough, but he knows he is weak,” he says, “Everywhere he looks, he sees threats to his rule, real and imagined. And so he uses state-owned media to preach paranoia and anti-Western sentiments to Russians. He faces a rising China to the east and hostile Islamic forces to the South, but he tells his people the biggest threat they face is from NATO.” Romney puts it in a Cold War context. Rubio, 25 years younger, puts it in a pathetic context. I still think they can jibe. 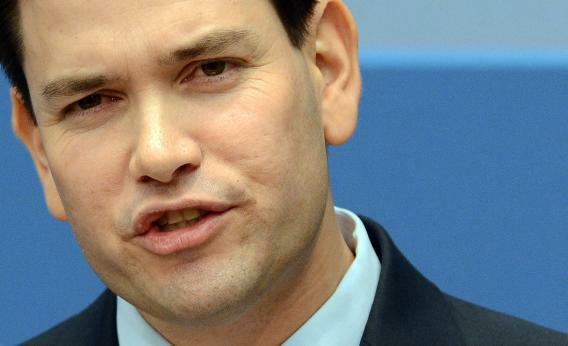 When does Rubio get more specific? When he talks about alliances. Effective international coalitions don’t form themselves. They need to be instigated and led, and more often than not, they can only be instigated and led by us. And that is what this administration doesn’t understand. Yes, there are more countries able and willing to join efforts to meet the global challenges of our time. But experience has proven that American leadership is almost always indispensible to their success. The United States will exercise leadership in multilateral organizations and alliances. American leadership lends credibility and breeds faith in the ultimate success of any action, and attracts full participation from other nations. American leadership will also focus multilateral institutions like the United Nations on achieving the substantive goals of democracy and human rights enshrined in their charters. Well done. Rubio doesn’t really say anything that Romney wouldn’t say.